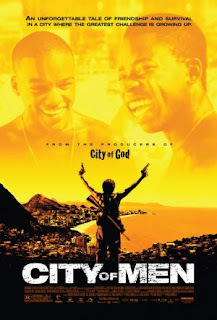 Friendship, fatherhood and the favelas of Rio de Janeiro comprise the tale told in City of Men. The film vividly depicts the seamier side of life--poverty, drugs, gangs, violence--as a stark contrast to the affluence of the Brazilian tropical resort paradise. Telling the story of best friends Ace and Wallace, two fatherless boys just turning eighteen, City of Men takes us along on their journey to adulthood. Although given the random violence and tenuousness of life in the poverty-striken hillsides of Rio, the odds against the two boys are great. Although it's less stylized, more conventional and not nearly as brilliant as its predecessor City of God (interesting factoid: Seu Jorge who had a small part in The Life Aquatic and contributed to its soundtrack was featured in City of God), it still offers a stunning look at the inhabitants who live on the fringe. Inured to gang warfare and violence, the sound of a gunshot invokes only a "one less" response from one the characters. And with the sound of machine gunfire when a gang war erupts, residents huddle behind metal doors waiting for the shooting to cease. There is death, homelessness, betrayal and constant shifts in power, but life goes on. With English subtitles, a cast of unknowns and limited distribution, it's unfortunate that few people will see this film. Despite the large cast (it took me a while to figure out who was who and what was what) and Portuguese dialog, it's an engrossing look at a way of life that is so foreign to most of us. Fatherless and future-less with a destiny left to the whims of fate, it's easy to see why the gang culture and the gun culture poses such an attractive alternative to those trapped in an unending cycle of poverty. As the tagline for the film goes: "An unforgettable tale of friendship and survival in a city where the greatest challenge is growing up." DWTS - Who will go home? Sucked in once again by DWTS! Like Buttah? Nah, like Suggah!